Strafford County Master Gardners will be pruning and fertilizing the bushes at the Joe B. Parks Riverwalk, Dover, on Thursday, April 30 from 10:00 am to 12:00. Rain date Friday, May 1, 10:00 am to 12:00. Many of you indicated that you would like to help out with this and we can use the help. Bring your pruning tools – there are some clippers and hand tools but not enough to go around. The website for the Riverwalk is below and it has directions. Please respond to Joan VanLandingham at rvanland@comcast.net if you plan to come. If the weather is inclement she will send an email to everyone signed up. This entry was posted in News on April 18, 2015 by admin. On September 11th 2014 a hearty group of volunteers from Northeast Credit Union, SunLife Insurance and a couple of Dover citizens under the guidance of Ann Reid- Steering Committee member of the Friends of Joe Parks Garden worked through a rain shower to tidy up the garden for fall. Than you so much ladies- it looks great! Visit our FaceBook page to see action photos. This entry was posted in News on September 21, 2014 by admin. This entry was posted in News on March 2, 2014 by admin. John Huff/Staff photographer Making Strides Against Breast Cancer volunteers Allison Alper, left, and Alissa Schintzius shovel debris into a front end loader as they work to clean up along Central Ave. in Dover Saturday during Dover Pride Clean Up Day. DOVER — Despite damp conditions, dozens of Dover residents turned out to help spruce up the city on Saturday morning. Civic groups and regular citizens once again took part in the city’s annual Dover Pride Clean Up Day, volunteering four hours of their time to pitch in at sites around Dover. The activity, held every year in the spring, gives residents an opportunity to help the city look its best for the upcoming tourist season and warm weather, according to coordinators at Dover Main Street. This year’s event was held from 8 a.m. to noon. Sponsors included Centrix Bank, Wentworth Greenhouses and Kendall Pond Pizza. The Kiwanis Club also provided a pancake breakfast to kick off the event in the Mill Courtyard at 421 Central Ave. Volunteers then helped rake, prune, sweep, mulch, weed, paint and tend gardens around the city. Norm Fracassa, of Fracassa Designworks, was the site leader in Henry Law Park, where he was joined by personnel from Dover Fire & Rescue and citizen volunteers. At the Rotary Trailhead, Sgt. Main Spiedel led a team from the Dover Police Department. Police volunteers were also deployed to the community trail, joined by a crew from Ryan’s Tree Service of Dover. Parishioners from New Frontiers Church pitched in at the Dover Public Library and the McConnell Center, under direction from Adam Cullinane and Gary Bannon. Volunteers from the Skate Park Committee helped to spruce up the city’s skate park.Saturday’s event drew participation from several Dover High School soccer players, who pitched in at the Joe B. Parks Riverwalk Public Gardens. About 30 people helped to prepare the gardens for the coming warm weather. Dover Girl Scouts were at the Woodman Institute Museum, working with Jill Brooks, and Wil Boc and Tony McManus directed citizen volunteers at Immigrants Park, the locale at the corner of School Street with benches and a small grassy area. Citizens also pitched in at Waldron Court and Orchard Street, where Shawn Sippel of Mandias Consulting was helping out. Other groups that participated in Saturday’s event included a contingent of children affiliated with the Seymour Osman Community Center in Dover, as well as students at the University of New Hampshire. “Something that makes Dover, I think, really nice is that we get hundreds of volunteers to come out for Dover pride clean up day,” Alexander said. The annual cleanup saves the city money on labor costs, and also allows Dover Main Street to tap into the expertise of volunteers like Fracassa, who spent hours with Alexander discussing landscaping plans ahead of time. “We really work hard, and people are proud to go back and look at the sites they worked on and see that they made a difference in the community,” Alexander said. John Huff/Staff photographer Contractors Wayne Coolidge, Wendy Coolidge, Dover Main Street Manager Michelle Alexander, Amy’s Retreat Steve Goren and Joe B. Parks committee member Connie Roy dedicate a new Joe B. Parks Riverwalk Public Gardens garden shed in Dover Saturday morning. DOVER — A new shed beside the Cocheco River will help lighten the load for dozens of volunteers who help maintain the Joe B. Parks Riverwalk Public Gardens. Located between 400 Central Avenue and Chestnut Street, the riverwalk is lined with wild flowers, rhododendrons, mountain laurel, hostas, daylilies and a variety of other plants. Volunteer caretakers have been tending the gardens since they were dedicated in 2008, bearing the name of local horticulturalist Joe B. Parks. Until recently, the tools used to maintain the gardens were housed in a collapsible shed beside the park. The facility was recently replaced with a permanent shed, using materials, money and labor donated by a variety of local business owners and organizations. The sponsors included: Dr. Sheila Kennedy; Dr. Robert Karelitz; Amy’s Treat, a foundation that supports patients at the Seacoast Cancer Center of New Hampshire; the Rotary Club of Dover; and W A Coolidge Company. The materials alone are worth about $1,700, according to riverwalk steering committee coordinator Elizabeth Fischer. Formerly a neglected area along the Cocheco River, the riverwalk features a Japanese Garden installed and maintained by Dover High School horticulture students; Lorraine’s Corner, a meditation and healing garden installed and maintained by Amy’s Treat, and dedicated in memory of Dover resident Lorraine Goren; and several sculptures created and installed in the garden by art students from Dover High School, according to information available on the website of the riverwalk organization. The space comprises 17 distinct garden beds, as well as public areas, all of which are maintained by volunteers. The shed, which was dedicated on Saturday, offers about three times the storage space as the previous shed on the site, said garden caretaker Steve Goren, of Amy’s Treat.“It’ll make it much easier,” he said, explaining the shed will reduce the hassle for the volunteers who tend the gardens.In the near future, DHS art students are planning to paint a design on the outside of the shed, which is located at the rear of the brick building at 400 Central Avenue. Since the gardens are dependent on volunteers, Fischer said, any amenity that will make volunteering more convenient is a boon to the health of the riverwalk. For many years, Lorraine Goren could be found working in Farnham’s Department Store in downtown Dover. Working for the family business and working for her beloved City of Dover. 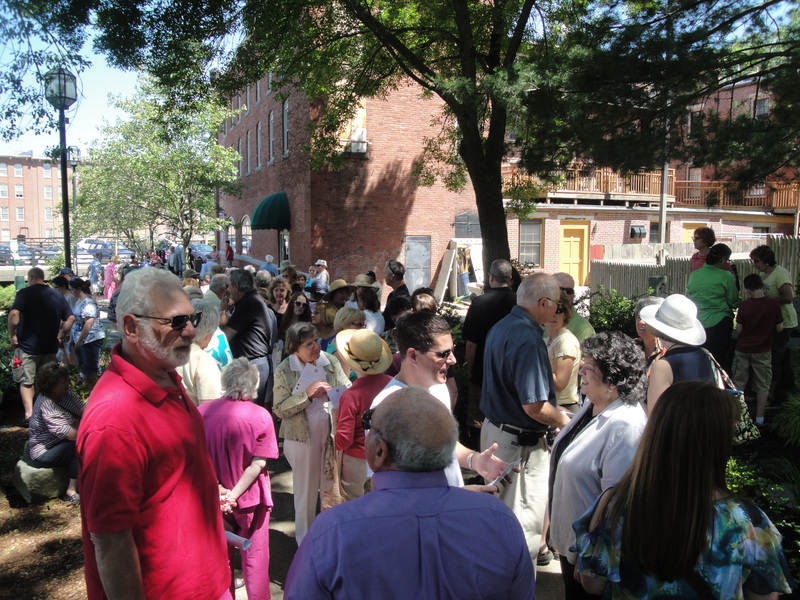 Goren, a long time resident of Dover, died from cancer in 2009, and was memorialized by several hundred people on the Sunday afternoon. Although diagnosed with cancer in 2005, Goren battled the disease continuing to do good works for the city and its residents. Sunday, the memory of Goren was honored as, just across the Cocheco River from that Farnham’s location, Lorraine’s Corner was dedicated. In the past year, a concerted effort by many of Lorraine’s friends plus the added support of Amy’s Treat resulted in the creation of the memorial located on the Joe B. 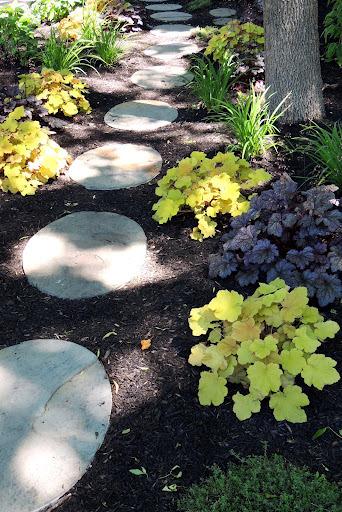 Parks Riverwalk, designed and implemented by Bernadette Norton with stonework done by Full Circle Stone Works. 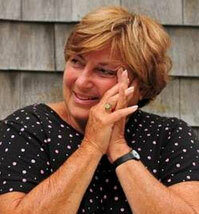 Goren was active in all areas of the community having been named, along with her husband, Dover’s Citizen of the Year. In attendance at the brief ceremony were Goren’s husband Steve; their children Dave and Sue; grandchildren, Aaron, Noah, Mathew and Nate. “This tribute is most fitting,” said daughter Susan, “my mother would have loved to see all these people here in this peaceful place. This entry was posted in News on June 12, 2012 by admin. EJ Hersom/Staff photographer Hanna Munoz sculpts a tree at Dover High School in an effort to support the Joe B. Parks Riverwalk Community Sculpture Garden in Dover. DOVER— After being awarded a grant from the New Hampshire State Council on the Arts and supported by the National Endowment for the Arts, Dover High School art students are helping revitalize the Joe B. 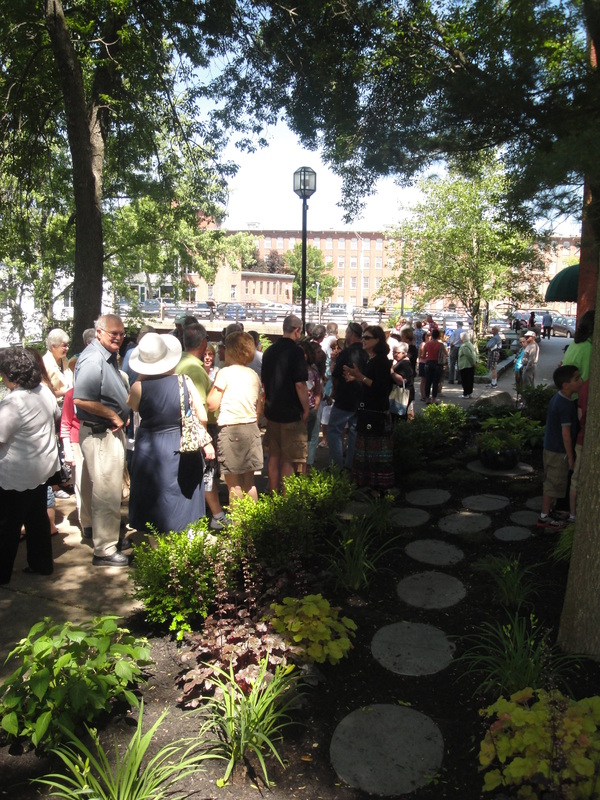 Parks Rover walk with a community sculpture garden. The garden and students artwork will be revealed to the public on Saturday, June 9, following months of work by local young artists bringing a fairytale theme to the space. “We wanted to come up with a fun theme,” said Peter Mareck, 17. Splitting up the work between classmates, students of Francine Kontos’ sculpture class are participating in the project just as professional artists would and with the help of Green Foundry casting services at Sanctuary Arts. Building stepping stones, a castle, a dragon and a number of other pieces, the students all said they really loved being asked to participate and look forward to having their artwork become permanent fixtures in the community. “We want it to be top notch. We want tot show the public that teenagers can do good things, too,” Michaela Therrien, 18, said. She and her peers understand that youths in the community don’t always have the best reputation and they intend to change that through their dedication to community and the artwork they’re passionate about. Therrien said she and her classmates want people to see that they each want to help improve the Garrison City. “We’re ready to be good Samaritans,” she said. The two-step process of creating each piece uses a new type of rubber new to the students as well and is being completed by the Green Foundry. “This whole project has kind of been an experiment,” Hannah Porter, 18, said. “It’s a big deal for these guys, they’ll be able to leave a legacy,” Kontos said. Christopher Strickland, district fine arts coordinator, wrote the grant proposal that allowed the students to participate in the project and get an authentic experience as artists. The building class at DHS will help to install the pieces in the garden where they will remain. An official ceremony to reveal the sculptures to the Joe B. Parks Sculptural Garden will be held at 11 a.m. Saturday and is open to the public. This entry was posted in News on June 8, 2012 by admin. DOVER — A portion of the Joe B. Parks Riverwalk public garden will be dedicated next weekend in memory of longtime resident and activist Lorraine Goren. 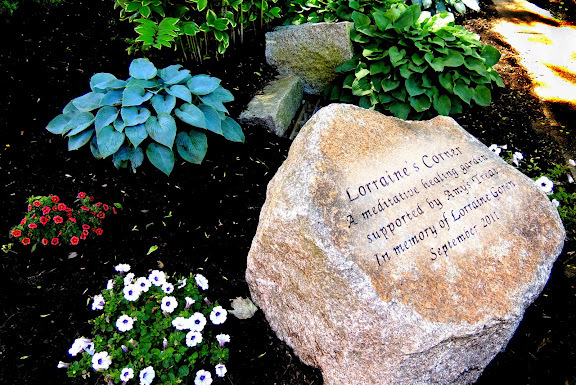 At 2 p.m. Sunday, June 10, a garden area in the pathway that runs along the Cocheco River will be deemed “Lorraine’s Corner” in honor of her tireless effort to the make the city a better place. Lorraine’s Corner is located in a section of the riverwalk that is most easily accessed next to Coldwell Banker on Central Avenue. Lorraine moved to the Garrison City when she was a junior in high school and worked at her family’s Central Avenue business known as Farnham’s Department Store. She spent her years as a resident displaying multiple acts of volunteerism and was named, alongside her husband, as Dover’s Citizen of the Year in 1997. In 2005, Lorraine was diagnosed with ovarian cancer. She battled the disease with her family at her side until she passed at the age of 68 in 2009. Despite dealing with cancer, Stephen Goren said his wife didn’t let it stop her from continuing to aid the city and its many residents. The Gorens were introduced to Amy’s Treat, a 501c3 that reaches out to those affected by cancer, during Lorraine’s four year battle. As a couple who loves music and theater, they were treated to a night out at the Seacoast Repertory Theatre. After Lorraine’s passing, Goren was again approached by the nonprofit. The group wanted Goren’s OK to create a meditation and healing garden along the Cocheco River walkway that would be a memorial to his wife. 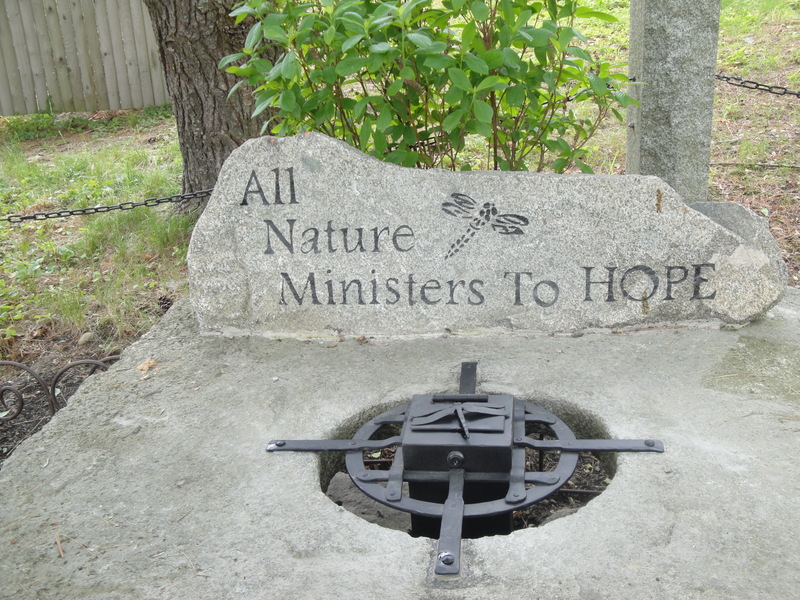 The memorial includes the installation of a stone near the Central Avenue entrance to the walkway bearing the inscription, “Lorraine’s Corner, where hope grows. 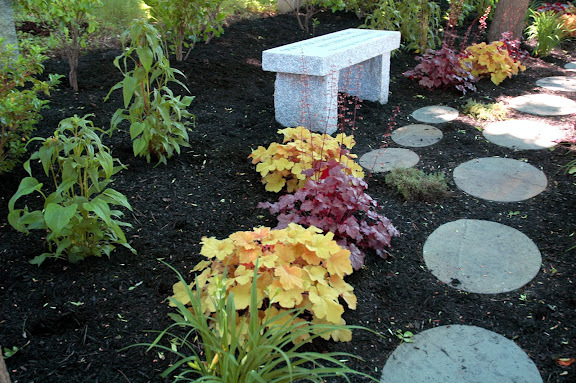 Meditative healing garden supported by Amy’s Treat in memory of Lorraine Goren.” Flowers and shrubbery conducive to healing and meditation have been planted, and benches and a stone walkway have been constructed as well. Goren said he thinks the location of Lorraine’s Corner is fitting because his wife was such a presence in the downtown community. As for the healing garden, Goren said he also thought that was an appropriate reflection of his wife’s spirit. “Lorraine is continuing to leave her mark on the city through the garden,” he said with a smile. Goren said he is hoping people will adopt a habit he has already created for himself, which consists of visiting the garden almost every time he passes through town. He said he hopes that Lorraine’s Corner will serve as a place for patients, their families and anyone looking for a moment of serenity to go and relax. “It will also help bring attention to what types of things Amy’s Treat does for the community,” said Goren. City officials as well as members of Amy’s Treat and the Joe B. Parks Committee will be on hand for the June 10 dedication. The public is encouraged to attend and enjoy the garden. This entry was posted in News on June 2, 2012 by admin. DOVER — Dover High School – In an effort to beautify and revitalize downtown Dover, the vision for the Joe B. Parks Riverwalk Public Gardens was established. Dover High School Art Teachers, Francine Kontos and Christopher M. Strickland collaborated with the local Dover Arts Commission, to develop a youth arts grant proposal that would allow Dover High School student artists to participate and engage in a community arts project. The project titled, ‘Joe B. Parks Riverwalk Community Sculpture Garden’, specifically involves the design and creation of sculptures that would enhance and expand on the aesthetic appearance and vision of the public garden in downtown Dover. As a result, Dover High School was awarded a grant from the New Hampshire State Council on the Arts and supported by the National Endowment for the Arts. The project provides an invaluable authentic learning experience and civic opportunity for students to learn about creating art for communal and cultural purposes and public display; learn how to interact and collaborate with local businesses and organizations and how the creative process is a valuable tool in the workplace. With the assistance of Green Foundry casting services at Sanctuary Arts, a variety of sculptural artworks are currently being created at Dover High School and will be added to the garden in early June of 2012. An official ceremony to reveal the sculptures to the Joe B. 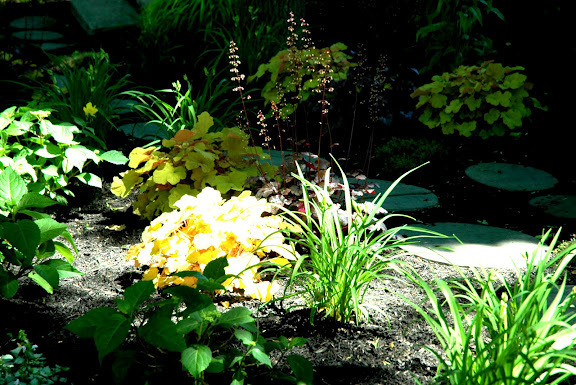 Parks Sculptural Garden will be held on June 9, 2012 at 11:00 AM and is open to the public. This entry was posted in News on May 10, 2012 by admin.